Winter has definitely arrived! I don't know about you, but I am ready for Spring! It has been very cold here, in the minus degrees, and I haven't wanted to go outside. What I have been doing is alot of baking...not only does it make my apartment smell really good, it also makes my kitchen warm! My Tip for today is a simple one: STAY WARM! If you are home, do some baking. Try and fill your oven with more than one item: for example, bake 2 cakes instead of one (you can always freeze the extra one), put some bread alongside the meat item: get creative! I have found that by arranging the pans just right, I can bake 3 things at once! After you are done with the oven, leave the door open; that extra few minutes of escaping heat will really help make the kitchen nice and toasty. 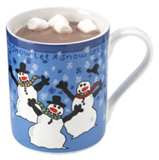 If you are at work, drink some nice hot cocoa, coffee, or tea during your break. Don't get a chance to leave your desk? Fill a thermos at home (or at work) and keep it by your desk. It'll keep you warm throughout the day. You need only add boiling water to this powdered mix and stir to make hot chocolate. 1/2 cup powdered nondairy creamer. btw: My daughter told me what you said about your tree, Helene! TOO FUNNY!!!! Do you see me turn red every week?? Huh?!? Doya?!? The Mexican chocolate is great. I get the Abuelita stuff in Chicago and recently discovered packets made just like hot chocolate packets. Even easier. I tried to get Christmas spirit but it didn't work this year. I beat up the tree. It was taunting me. For the first time ever (18 years in this house alone) I bought myself a sofa, love seat and recliner. No hand-me-downs, no thrift stores. Found a great deal and treated myself instead of buying for others. I LOVE it! I didn't know which to sit on so I just bounced around from one to another. And now I'm getting to the point where I'm not ashamed to have people over. I finally have something NICE to sit on. Mom Earlene Says, "GOOD FOR YOU, HELENE!" I love me some Mom Minutes! Good idea. I hate the cold. Why do we live here when we could to to FL? I love hot! I still think that I should have hitched a ride with Santa Claus on Christmas Eve...I could be in Florida, RIGHT NOW, sipping an ICED coffee, hanging out at the beach with my twin sis, and living the good life. But did I? NOOOOOOO....Oh well, there is always NEXT year! It's cold in Florida right now. They're out buying coats. Why not just give mom my phone number-think she'd notice she has another daughter to call?? I just talked to my twin sister..she is NOT happy...she said that she moved to FL for warm weather and it is NOT warm! Thanks for all the tips. I think I will make some chocolate peanut butter cookies. I have to sneak all the ingredients out of the pantry. I can do it while my wife is on her computer.